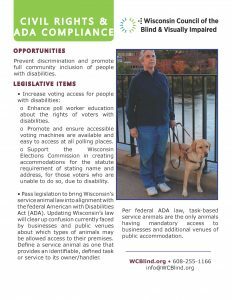 Every second Tuesday in April, Council staff, board, members and allies of the blind and visually impaired community gather at the Wisconsin State Capitol. 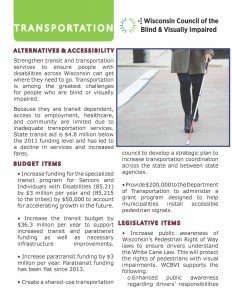 They advocate legislation in line with the Council’s legislative priorities, build relationships with legislators and their staff, and get updated about important issues facing people who are blind or visually impaired in Wisconsin. Legislative Day provides an excellent opportunity to open lines of communication between constituents, the Council and the legislature. Our next Legislative Day is tentatively set for Tuesday, April 14, 2020. We typically meet from 10 a.m. to 3 p.m. at the Wisconsin State Capitol building. This date and time are subject to change closer to the event date. This is your chance to connect with your representatives. 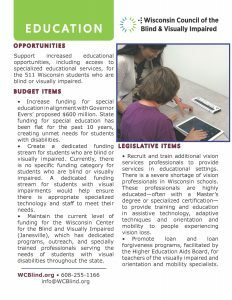 Meet face-to-face with legislators to champion issues important to people who are blind or visually impaired. Registration is not yet open for 2020. For more information, email Adam or call 608-237-8120. 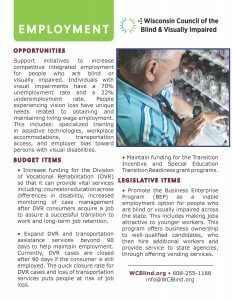 You can view and download our legislative briefing documents covering Civil Rights, Education, Employment, Healthcare, and Transportation. 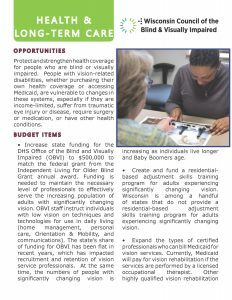 More information on these issues and other policies can be found on our Advocacy page.